A former technical writer for Boeing, Dennis Berry now lives in Oregon. During the 1990s, he and his wife Elizabeth Berry, also operated a B&B on Bainbridge Island. 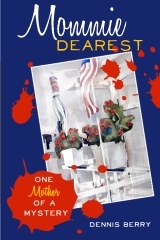 Drawing on both his professional and personal experiences, Berry published Mommie Dearest in 2011. The book's protagonist Andy Eastman lives a seemingly bucolic life on Bainbridge Island. However, things are falling apart. His wife has left him and when he agrees to help a friend find out what’s wrong with her husband, Andy uncovers a conspiracy that involves Boeing. Will he be able to fight the criminals and also save his marriage? Fellow author Dennis Fairchild says "Berry is a talented writer who alternately charms and chills. His Mommie Dearest’s good guys and not-so-nice guys provide an entertaining chase through the beautiful Northwest, the world of corporate crime, and into nests of families you quickly get to know and love—plus some you should avoid like crazy.” Also in 2011, Berry co-authored Eye Wit with his former Bainbridge Island neighbor Hazel Dawkins. For more information on Dennis Berry's books go to http://murderprose.com/MurderProse/Home.html.